"I still cannot believe looking at this picture, that this is me. I have struggled with my stomach most of my life. I wasn't a big person growing up but I never loved how my stomach looked when I put on a bikini until now. My husband's program has changed my life forever, simply because now I understand how to sustain this lifestyle forever. In the past I've tried many diets and trainers, only to fail or witness minimum results. The TP Experience is easy to follow, the workouts are fun, and the nutrition plan is enjoyable. I recommend his program for any unsatisfied person that wants to change how they look forever". The customer service "The TP Experience" provides is excellent. I enjoy the fun workouts and absolutely love the encouragement TP offers day in and day out. Kickboxing on Monday is my favorite workout in his program. Being a single parent of two, going to the gym is very hard for me. The live online workouts is so convenient for my lifestyle. The kids join in the workouts which is very important to me. If you are looking to lose weight and finally enjoy it. The TP experience is the program for you. Marcus has lost over 70 lbs so far on his weight loss transformation journey. Watch the video as he explains his past failures, his experience on the TP Experience journey, and "WHY" he started to get very serious about his health. He has another 75 pounds to go and is very determined to get it off. I went to high-school with Terrance and knew him as BIG T. He is slimmed up now, so I guess we can call him LIL T. lol When I found out he lost over 100 pounds, I was truly impressed and inspired. Being a school teacher can be stressful at times and I would always put everyone first before me. So I made a decision before the new year of 2015 to focus on me, me, and me. It was one of the best decisions I made in my life. Yes the road has it ups and downs but I stayed in the fight. Terrance's encouragement and understanding of the weight loss battle is priceless. If you are in need of a true leader that has been through the storm, Terrance is your guy. About two years ago. I was going through the motions with my career and health. I knew at that point I needed to change the way I was living. I started at 203 lbs. and went to 154 lbs. in about 8 months. I yet again lost focus because I let life take me off my course. Realizing the need to get back on my journey, I was happy to meet Terrance through a friend. He asked me what I wanted to look like and how much time I was willing to put in. I expressed to him that losing the weight was not my issue, it was keeping the weight off. He then set up a meal plan and exercise schedule. I am grateful for the TP Experience and how it changed my life. Keeping the weight off is no longer my problem because he taught me core habits and lifestyle behaviors to sustain forever. So if you struggle the way I did, The TP experience is your answer. I enjoyed working with Terrance and his 4-Step Formula pushing me mentally to levels I never thought I could reach. His practices teach you how to become great at losing weight and are unmatched. I feel like a new person and I am finally satisfied with the person I see in the mirror. If you are like me and need to learn how to win then buy his book "Play by Play" and follow his weight loss formula. On my birthday I asked my husband to get me a personal trainer. I was tired of trying to lose weight and yo-yoing up and down. I had become so focused on working, running a business, taking care of the boys, and everybody else that I had forgotten about myself. I was ashamed of the 211 pounds I had let myself get up to. The truth is, I was miserable in my body. Joining the TP Experience was convenient for my lifestyle and he the process easy for me to sustain. I am thankful to Terrance for getting back to me and keeping me encouraged. I am starting to love my body and myself a little more each day. I recommend anyone to give the TP Experience a shot because it changed my life forever! It wasn't until I made a firm commitment to make a "Lifestyle Change" that I was able to lose 155 lbs. Terrance Pennington was instrumental in my transformation with his commitment to helping me win my life back. Terrance thank you for your 4-Step Formula, motivation and pushing (sometimes) pulling me up the hill that has led me to a healthy lifestyle for over 4 years now. This guy is who he says he is!!! As a full-time physician and operating two practices in two different states makes it hard for me to sustain a workout regimen. Discovering the TP Experience not only made working out easier to maintain but also I am able to workout anywhere. I can workout in my home, office, and hotel rooms. Using modern technology is the new way of fitness for anyone that may have a busy and demanding career and lifestyle. As a physician I want to walk the walk and talk the talk for all of my patients. This program enables me to now live the healthy lifestyle I preach to my patient’s day in and day out. "When my cousin Terrance reached out to me and asked if I was ready to learn his way and pass onto me what he worked for himself. I jumped at the oppurtunity. We talked over a few weeks and he sent me material that helped me not only learn what I had been doing wrong, but WHY it wasn't working. He broke it down to the point where I could follow, and it made sense to me. He taught me the importance of preparedness, meal planning, meal prep, the processes he went through, and what to expect on my new weight loss journey. Terrance taught me how to be responsible for my dietary actions and helped me focus on a gym routine for my particular needs. He helped me to understand foods and food types, which have brought a complete 360 in the way I eat, train, and focus on my weight loss journey. I can't thank him enough for the time and effort he's provided me." Over the years, I let my weight gain tear down my confidence and self-esteem. Following TP's transformation system was easy to understand and sustain. Terrance personally has been through the weight-loss struggle so he knows how to talk to his clients when they are feeling down or discouraged. His ability to offer solutions to my problems instantly helped my journey run smoother than any of my past weight-loss attempts. If you want to lose a massive amount of weight or maybe the last 10-20 pounds off your body. Joining the TP Experience is a decision you must make for yourself now. I am glad I did and I wouldn't change my decision for the world. Working night shift hours along with managing many store, I put my health on the back burner. I was also tired, hated my body, and tired of failing attempts. Feeling my frustration and lack of energy, my wife reached out to Terrance. His encouragement and transparency knowing that he battled the same issues I battle was refreshing. The process was enjoyable, When work would try to take me away from fitness, Terrance will reel me back in. This new energy of life and body I wear is what my family deserves. Learn from Terrance because he will teach you how to win forever! I met Terrance at a time when my self-esteem was low and my mental state wasn't healthy. 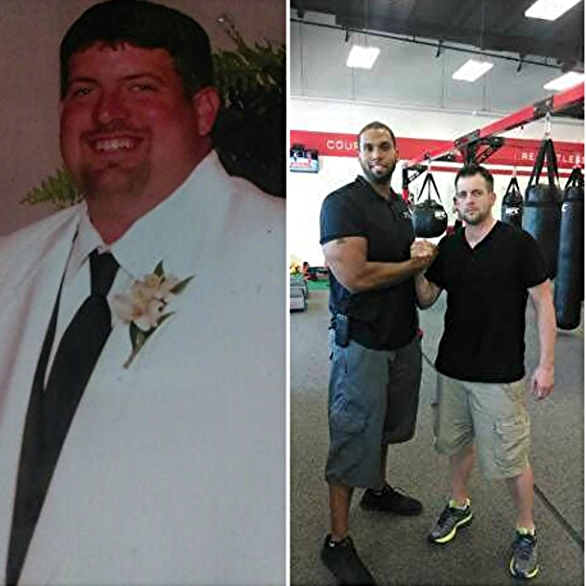 Terrance's mental training approach in his transformation program not only helped me to lose 35 pounds but now know how to control my emotions. My emotions were my biggest problem when I tried to lose weight in the past. Terrance behavior's techniques will teach you how to control your emotions and his Focus Board tool will help you stay on track. I hope you take on the TP Experience so you can reach your happiness and fitness goals too. Last year in April, I was the bride to be that was 5'2 and weighed 166 pounds that wanted to look her best for one of the most important days of her life. I had 4 months to meet my goal of 145 and I knew it was going to take dedication, motivation, and accountability.I wanted to do it the good old fashion sweaty way. I knew I couldn't do all of this alone. Wedding planning and all the emotions that come with it would get the best of me without someone making sure I was being accountable. I asked Terrance for help and he introduced me to my new way life using his transformation weight loss system. He was one of those gentle giants (literally) that was very patient. Terrance introduced me to a new way of thinking, eating, and the true definition of working out. My body might have been working the hardest it ever has worked before but so was my mind. I surpassed my goal and lost 28 pounds which put me at 138. Saying thank you to Terrance is just not enough because I am now passing along what I learned to others. I look and feel great, but most importantly I'm healthy. My favorite part about my whole journey with Terrance was that it was as if I started off riding a bike with training wheels at first and then you look back one day and you no longer need them. Any bride that needs to get ready for their wedding, the TP Experience is the way you want to go.